I know that everyone is very busy right now and that’s why you need an outfit you can put on in the morning and use for many other occasions. Since it’s pretty cold outside you also need some knitwear to keep you warm and protected from the weather. I found the perfect knitwear for you, this one. I bought it from H.M. at a really good price and if you order it super fast you will get it in time for the Holiday season. Otherwise I am sure the cold is going to be with us until march so you can still use it. The loose fit means you don’t have to worry about a too-tight bust or an underarm that’s drooping down too far. The key for this type of knitwear is comfort. I paired it with these black trousers I bought from Gina Tricot( similar here) and high heeled boots. I have small legs so in order to wear those types of pants I need to have a bit of heel otherwise I will dust the floor with the flared legs. It also gives me an excuse to wear high heels hehe. The best part is that they are very comfortable so I can walk in them the whole day. For me this is a daytime outfit that I would wear for casual Friday at work, a lunch date or any other day to day activity. So there you go, an easy day by day outfit. 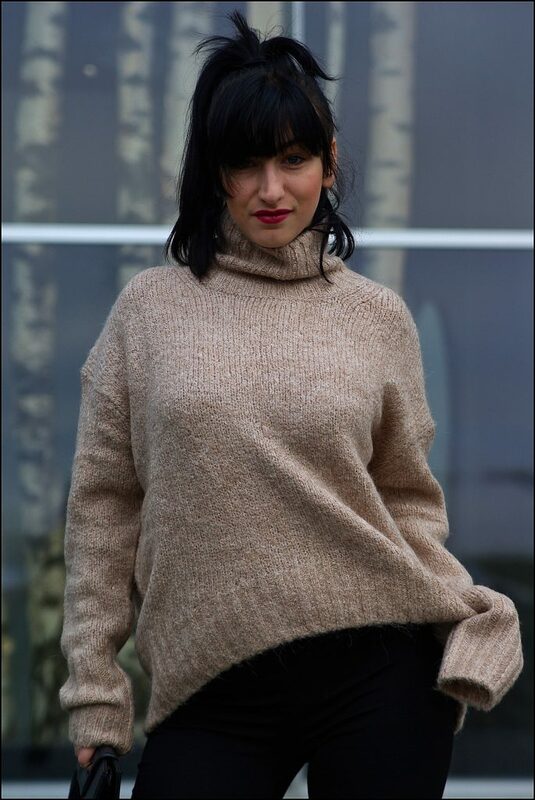 Both the sweater and the flared pants can be easily matched in many different ways. P.S. If you are looking for more sweater outfits ideas check out my previous articles “winter holiday outfit”’, black and red outfit (that red sweater is so christmasy) or layered sweater look.